To this day, the Australian Kelpie is the most popular sheepdog breed in Australia. These medium-sized sheepdogs are considered the best performing for their size, making them a favorite among sheep farmers across the globe as well. Their compact bodies showcase strong muscles, well developed limbs and naturally prick ears. Kelpies generally come in a variety of colors including black, red, chestnut, tan, bluish-grey, dark chestnut or a combination of these. Even though these dogs are small, they work without limitations and are capable of herding or guarding goats, cattle, reindeer and poultry. Australian Kelpies are light footed and extremely agile making them outstanding shepherd dogs. They possess strong natural herding and guarding instincts, and are capable of lightening, running starts as well as dead stops. Their abilities are matched by their inexhaustible supply of energy and devotion to their work. Kelpies are a versatile breed with a passion of getting the job done. They are intense in the field and will work hard, even in extreme discomfort. They are mild mannered in the home and rarely affection, although they are friendly to their masters. Australian Kelpies are highly intelligent dogs that tend to take great pride in their work, which can be gleaned from their appearance and behavior. They are highly energetic, responsive and keen dogs that do not prefer the confines of small spaces or apartments. While they are amazing shepherd dogs, Kelpies are rarely affection toward people and tend to be one-person dogs. They will be devoted to their owners and maintain a mild, calm demeanor while resting at home. Kelpies have an uncanny ability to distinguish between work and rest which is noticeable from their intensity while in the field. Australian Kelpies are independent thinkers who enjoy their work and will be dedicated to their tasks. Australian Kelpies feature a short coat that is relatively easy to groom and maintain. These dogs only need bathing when necessary and should be brushed or massage with a towel on occasion. 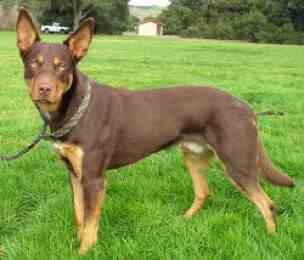 The Australian Kelpie is prone to several health issues including hip dysplasia and genetic bone disorder. This breed may also experience Progressive Retinal Atrophy or PRA. As a working dog that needs and loves having a job, daily exercise is essential to the Australian Kelpie. They enjoy having freedom to run in open spaces and should therefore avoid apartment living. Australian Kelpies are highly intelligent making them very trainable. As puppies, Kelpies are calm and obedient allowing them to learn well.